Stiefel’s Wyeth Songs redefines the idea of multimedia, snatching it back from modern technology and reclaiming it for the old school ideas of community, tradition, and love. Poems by David Livewell from his book Woven Light: Poems and Photographs from Andrew Wyeth's Pennsylvannia. When I first imagined a choral composition for children living in the Brandywine Valley of Pennsylvania, my immediate thought was to make a piece about artist Andrew Wyeth (1917 - 2009). He was the first artist I could name, since my mother, a watercolorist, owned many of his books and displayed them on coffee tables in our house--the perfect height for a child to stand and flip through books. I distinctly remember trying to imagine stories depicted by his mysterious pictures. Fortunately, I discovered David Livewell's book of poems, Woven Light, a book Wyeth himself called "powerful" and "deeply moving." Each exquisitely crafted and researched poem addresses a specific work and is a veritable lesson on how to view a Wyeth painting. 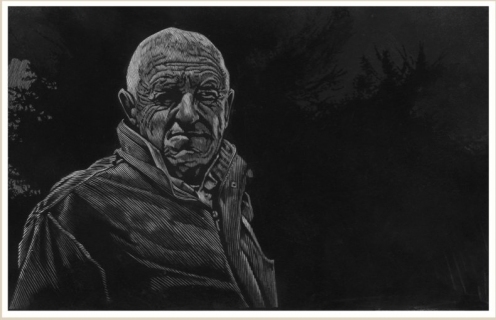 I chose three poems suggesting themes central to both Wyeth's work and to this commission: childhood's presence in the adult's life, art practice as an intergenerational shared experience; and lastly, landscape as a locus of memory. Despite the stillness and austerity of many of Wyeth's images, for me, they are spirited by sound. Or to put it another way: the absence of sound is keenly felt as I search for it in the visual texture. The paintings seem to rattle, rustle, moan, and jangle with unseen life. These are not just abstract, free-floating sounds, nor are they merely causal links to what we see. I believe the hint of sound in these paintings suggests constants that cannot be directly rendered and which inhabit a space where the lives of subjects, and artists, and viewers meld for an instant in time.